Inscribed on verso of the mount, "Musée de Rome, vente Pellet, Hôtel Drouot, 24 January 1882." An artist sits drawing in an ancient sculpture gallery. Light streams in from the left, where the gallery is open to a courtyard. During the eighteenth century young artists flocked to Rome from all over Europe to study the monuments of antiquity and the Renaissance. 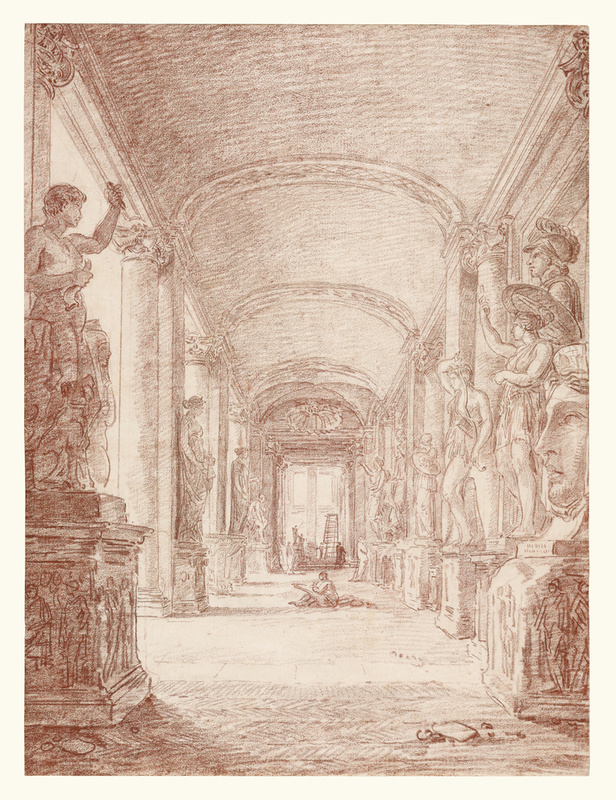 This red chalk drawing depicts the Capitoline Museum, a gallery of ancient sculpture which opened in Rome in 1734 and quickly became a de facto classroom for aspiring artists. The figure of the draftsman is likely Robert himself. His choice to place the draftsman surrounded by monumental sculptures, creates a sense of the overwhelming effect of the ancients on eighteenth-century artists.